2014 world cup, Brazuca: The physics of Adidas’ new World Cup ball. Will Adidas’ new World Cup ball, the Brazuca, fly straight or swerve like mad? The Adidas Brazuca and the FIFA World Cup trophy in 2013 in Rio de Janeiro. There are now only a few months to go until the biggest sporting event of 2014—the FIFA World Cup in Brazil—and questions are being asked. Will the stadiums be ready? Are the airports ready for the crowds? But one matter rises above all others and may have an impact on the destiny of the cup itself: How will the ball move through the air? 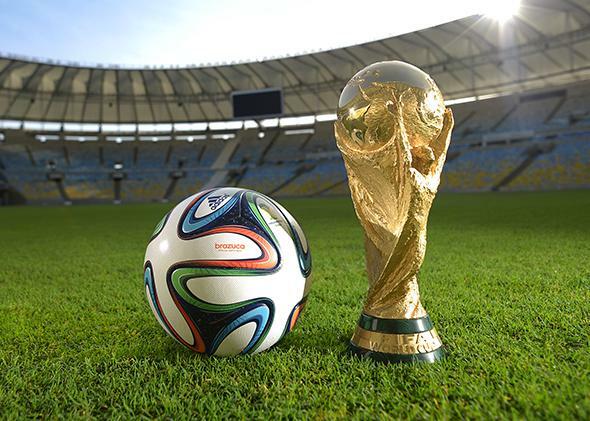 The words “Love Me or Lose Me” appear beside Adidas’ new World Cup football, the Brazuca, on billboards the world over. They implore the reader to accept the football for what it is and may be a subtle nod to the controversy that dogged the Brazuca’s ancestors: the Jabulani and Teamgeist. Since 1970, every World Cup football has been made by Adidas, an ideal opportunity to showcase their latest developments in ball design and technology. (Disclosure: I work at the Centre for Sports Engineering Research at Sheffield Hallam University, which has worked on some projects with Adidas. No one at the Centre for Sports Engineering Research has worked on Adidas’ World Cup ball.) In 2006, they took a radical departure from the norm with the Teamgeist. Traditionally, a football is constructed from 32 panels stitched together by hand. The Teamgeist had 14 panels that were glued together with heat (thermally bonded), resulting in a ball that was more “marble-like” than previous generations. The change was not only aesthetic. Players using the ball complained of erratic behavior in flight. For the next World Cup (South Africa, 2010) Adidas considerably redesigned the ball, the Jabulani, which had only eight thermally bonded panels. Unfortunately, criticism of the ball was, if anything, louder than it had been four years earlier. Many coaches and players compared the Jabulani to a beach ball that swerves unpredictably. What, if anything, went wrong? And will the same fate greet the new ball, the Brazuca, which has just six polyurethane panels? Many of the barbs aimed at the previous footballs commented on their unnatural lightness—hence the frequent comparisons to beach balls—but both the Teamgeist and Jabulani are just below the maximum mass limit of 445 grams (the lower limit is 420 grams). Their radical design is different from a standard stitched football in two ways. First, fewer panels mean shorter seams. By my own measurements, a 32-panel football has a seam length of around 405 centimeters, compared to 345 cm on the Teamgeist and 203 cm on the Jabulani. Second, thermal bonding created a much lower seam profile. A laser scan of the surface of the Jabulani and a stitched football shows the stitched seam is more than twice as deep as the Jabulani’s. The floating, beach-ball-like behavior of these footballs isn’t because they are light, but because they are smooth. 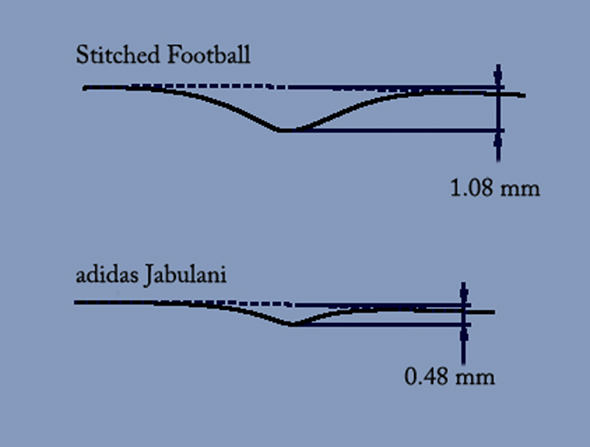 A laser-scanned profile of the seams from a 32-panel stitched football and the Adidas Jabulani. As air flows over a smooth, sleek object, it hugs the surface until it has passed over it completely, creating very little drag. Air flowing over a ball behaves differently. It separates from the surface, creating an area of low pressure behind it—a wake. The low pressure region creates drag force and slows the ball. At low speeds, the air flow is smooth (laminar) and separates early, creating a large wake and relatively high drag force. As speed increases, the air becomes more chaotic (turbulent) which helps it stick to the ball for a longer period of time, reducing the size of the wake and lowering drag force. The wake behind a scale-model football at low (left image) and high (right image) air speed. The difference in the size of wake is clear. The seams of a football disturb the air, helping it to enter “low drag” at lower speeds. A perfectly smooth football would be unplayable; high levels of drag would radically alter the behavior of the ball. In addition, at certain speeds a ball can experience smooth and chaotic air flow over different regions of its surface. The resulting asymmetrical wake creates a force imbalance, pushing the ball in a particular direction. While cricket and baseball players take advantage of this effect to create swing, in football the effect occurs at speeds too low to be useful. 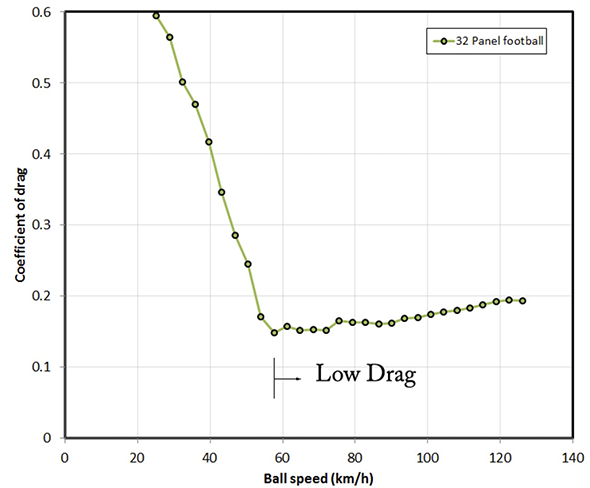 The image below shows the drag behavior of a 32-panel football. It enters low drag at around 60 kilometers per hour, at which point the chaotic or smooth method of swerving is mostly unavailable. The swerve in football is generated by spinning the ball. How the drag of a 32-panel football (measured as the coefficient of drag) changes with air speed. Data obtained from a wind tunnel. The kind of shots that caused trouble in 2006 and 2010 were flat, because the ball had very little spin. The ball seemed to move unpredictably, suddenly swerving and changing direction. Due to the balls’ smoothness, chaotic or smooth airflow could occur during shots and free kicks. In addition, low spin causes the forces acting on the ball to change direction rapidly and unpredictably, leading to unstable flight. This is equivalent to the movement associated with a knuckleball in baseball. This effect can occur with other footballs, but the increased smoothness of the Jabulani and Teamgeist made it occur more frequently, at speeds regularly experienced in play. Will the new Brazuca behave in the same way? There are a couple of reasons why I don’t expect the same amount of controversy at this World Cup. Although the Brazuca uses the same thermal bonding technology of previous generations, the seams are much deeper. This is obvious when handling the ball, and a laser scan shows a depth of 1.56 millimeters—50 percent deeper than the 32-panel ball and three times deeper than the Jabulani. The scanned seam profile from the Adidas Brazuca. With six panels, the Brazuca has the fewest panels of any World Cup football. However, I measured the seam length to be 327 cm, greater than the Jabulani. Each panel resembles a four-armed windmill and doesn’t have the large regions of smoothness present on previous panel designs, which further avoids the chaotic or smooth airflow problem. 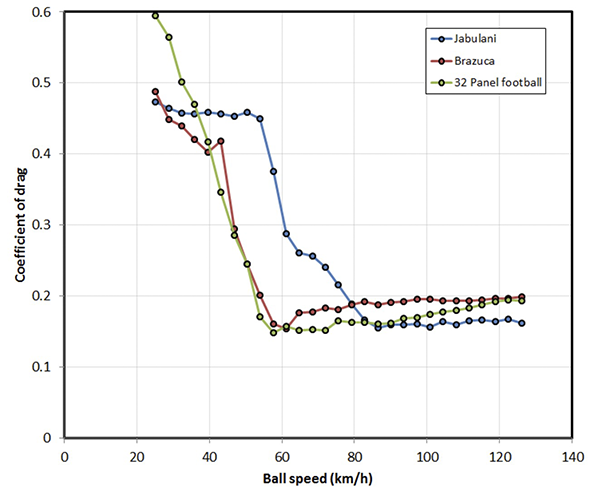 To complete the argument, the figure below shows the aerodynamic performance of a 32-panel football, a Brazuca, and a Jabulani. Notice how the Brazuca behaves very similarly to the 32-panel football and how the Jabulani doesn’t enter low drag until nearly 90 kilometers per hour, making it prone to the chaotic or smooth behavior described earlier. The aerodynamic data for a 32-panel football, the Adidas Jabulani, and the Adidas Brazuca. Data obtained from a wind tunnel. It is interesting to note that the frenzied media reports regarding the odd behavior of the Jabulani died down once the matches had begun in earnest. While players and coaches may well find something to complain about with the Brazuca, it is certainly not a beach ball.